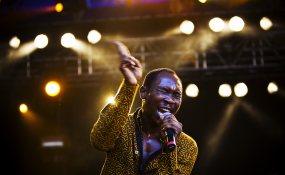 A Grammy Win for Seun Kuti? Seun Kuti's fourth album, "Black Times" album has been nominated in the Best World Music Album category at the Grammy Awards. Seun, who is the son of Afrobeat originator, Fela Kuti, shared the news on his Instagram page on Saturday and urged his followers to vote for him. The 61st Grammy Award is scheduled to hold in February, 2019. "Black Times", released in March, debuted at number eight on the Billboard World Music Chart in the first week of its release. Seun delivered a socially conscious album backed by his father's Egypt 80 ensemble. The album's second track 'Black times' which featured Mexican-American musician, Carlos Santana, shed light on the common problems of leadership confronting many African countries. Martin Meissonnier, who had already produced two albums for his father, produced Seun's 2008 debut album, 'Many Things'. His second studio album 'From Africa with Fury: Rise' was released in 2011. It was recorded in London, produced by Brian Eno, John Reynolds and Seun himself. Seun's brother, Femi has also bagged four Grammy nominations in the World Music Category. He got his first nomination in 2003 for the album Fight to Win. Subsequent nominations came in 2010, 2012 and 2013.